If you choose shipment by Fedex, extra shipping fees will be required. ACE ONE works on all kinds of helicopters: Bi-blade, tri-blade aircraft, aircraft with or without flybar, all kinds of swash plates and rotor heads, electronic or gasoline or turbine helicopter engines. All types of helicopter can be installed with ACE ONE quickly and easily. ACE ONE components weigh under 150g combined, which can be almost ignored from the payload. The size of the main controller is 61mm x 39.6mm x15.8mm, IMU module is 40mm x 31mm x 26mm, and the GPS module has a diameter of 50mm and a height of 9mm. The whole ACE ONE package is smaller than a standard package cigarette box. ACE ONE can even be installed on size 450 helicopter. The innovative built-in damping system allows the helicopter to be installed without additional frames and dampers. The system helps customers to minimize size, reduce weight and gives simplified installation that can be applied on different helicopter models. Customers also have more options for physical installation. 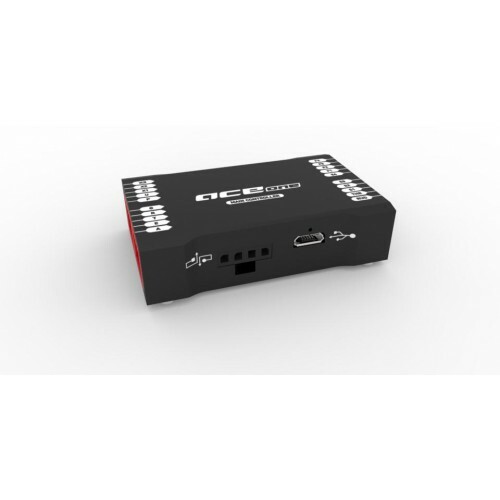 ACE ONE offers four types of control modes : GPS Cruise Mode， GPS Atti. Mode, Atti. Mode, Manual Mode. Customers can switch between the four modes to adjust different flight environments even in the specially weak GPS environment such as: Building clearance, valley clearance, bridge bottom or mountain cave. ACE ONE can also adjust automatically in the flight environment. For example when aircrafts come through the bridge bottom with GPS intermittence, ACE ONE system will switch between GPS mode and Atti. Mode automatically to ensure safety and security of flight. In GPS cruise mode, it not only keeps aircraft attitude stable, it will also lock the aircraft position accurately. Flight speed control; Stick center position for 0m/s, its endpoint for maximum speed set by user. GPS cruise mode helps aircraft with accurate and smooth flight movement that is specifically required for aerial photography. GPS Atti. mode has the same performance as GPS cruise mode. The only difference is the helicopter attitude control. Stick center position for 0˚ attitude, its endpoint for 45˚which is a fixed limit. GPS Atti. mode can be used promptly and with a big flight movement. It will bring to you a new and excellent flight experience. Atti. Mode is suitable for when no GPS or weak GPS signal is achieved. ACE ONE can control attitude stabilization and lock flight altitude accurately; Stick center position for 0˚ attitude, its endpoint for 45˚which is a fixed limit. Atti. mode also can be used promptly and with a big flight movement. Manual Mode is mechanical driving directly. With flybarless support, autopilot will not stabilise the aircraft. Manual Mode is suitable for the experienced pilot. Autopilot system offers longitude & latitude locking and high accuracy hovering. Even in a windy environment, aircraft can hover in a small scale area. Accuracy: horizontal≤2 meters. Altitude≤0.5 meters. With the help of ACE ONE, controlling aircraft feels like driving a car, as simple and intuitive strong control of the flight itself has become an easy and precise operation; The pilot can focus more attention in other areas, such as controlling the camera angle, without tension in the driving. In 【GPS Cruise Mode】or【GPS Atti. Mode】or【Atti. Mode】, requiring only a push of the throttle (collective pitch) stick gently to take-off helicopter, the autopilot system will be in charge of the cyclic pitch/roll stabilization. Enhanced failsafe is the feature to ensure that the helicopter will hover automatically if it loses the RC signal. After losing the signal in a certain time period, ACE ONE will calculate the safest way to return the helicopter to the home position. The helicopter will hover over your GPS start point and land automatically. This feature will protect your expensive payloads and equipments. The tail gyro and FBL have become standard features of ACE ONE. No more extra work installing additional tail gyros and FBL electronic parts. The helicopter’s electronic system has been greatly simplified. Therefore different electrical parts can be connected much more easily. One central piece calculates all of the flying configurations. The engine speed lock and governor are also standard features for ACE ONE. The built-in engine governor simplifies the parameter settings, and increases the compatibility of the system. All you need is to connect an extra standard sensor to use. The professional DJI R&D team continuously provide the latest control algorithm and features/modules. You don’t have to mail the unit back or find service centres to upgrade anymore. All the upgrades can be done online. All you have to do is clicks! Ace One can be upgraded to ground station. This is more powerful un-manned platform to satisfy the high requirements of our customers. Customer can activate the different function to meet their specific requirement. Ground Station equipped with 3D map and virtual flight dashboard that offers the flight real time data of attitude, position, speed and angle. The radio signal, accelerator position and Servo voltage are also displayed on ground station. Our autopilot systems and autonomous aerial platforms are used and applied in a wide range of commercial and industrial applications such as; aerial photography, surveillance, cartography, survey & rescue, power/ lines inspection, forest patrol, filming & advertising, police pursuit, military stealth, etc.